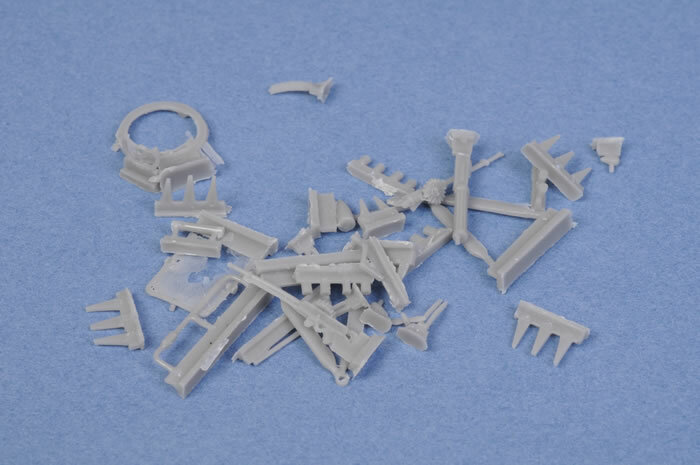 Advantages: Beautifully detailed resin kit of a very rare ‘tween wars RAF light bomber. Disadvantages: None; beyond the skill required to make a resin biplane kit. 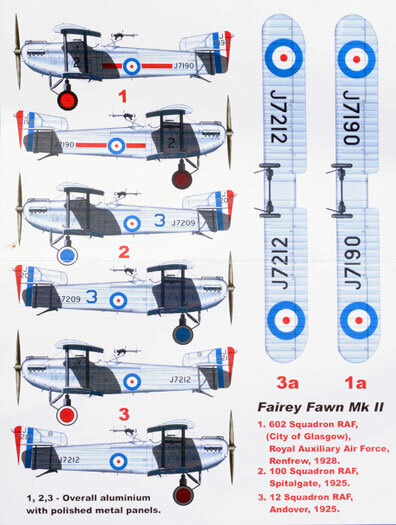 Conclusion: Straightforward construction (for a resin biplane) and offers enthusiasts of between wars RAF aircraft a beautiful kit of a very rare machine. The Fairey Fawn was designed as a replacement for the Airco DH.9A in the light day bomber role, to meet the requirements of Spec. 5/21. It served as a stopgap type used until more sophisticated types became available. The Fairey Fawn was powered by a Napier Lion engine, a rather unusual design among aero engines in that the 12 cylinders of the engine was laid out with three banks of four cylinders sharing a common crankcase in what was called a "broad arrow" or a W-block. The reasoning behind this configuration was to provide an engine that combined high power, low weight, and a low frontal area. The first of three prototypes flew on 8th March 1923. The second and third prototypes were fitted with lengthened fuselages to improve stability, and this was adapted for the production version (Fairey Fawn Mk II). The Fawn was fitted with fuel tanks above the top wing in order to meet Air Ministry safety requirements. Ironically, these tanks posed a hazard to the pilots if the aircraft overturned on landing. Fifty Fawns were ordered in August 1923 to re-equip the home based DH.9A squadrons of the RAF and these started service with 12 Sqn RAF in March 1924, later equipping two further regular squadrons, 11 Sqn and 100 Sqn. The Fawn was not a popular aircraft in RAF service, having little better performance than the aircraft it replaced, and having a poor view for the pilot owing to the bulky Lion engine. Consequently, the Fawn was remained in service for a relatively short time, two years in all, finally being replaced in these three regular squadrons in 1926, by the Hawker Horsley and the Fairey Fox. The aircraft freed up were used two equip two Special Reserve and Auxiliary Air Force squadrons, (No 503 (County of Lincoln) and No 602 (City of Glasgow) Squadron these remaining in service until 1929. Including the prototypes, some 75 Fawns were built and used from 1924 until 1929. 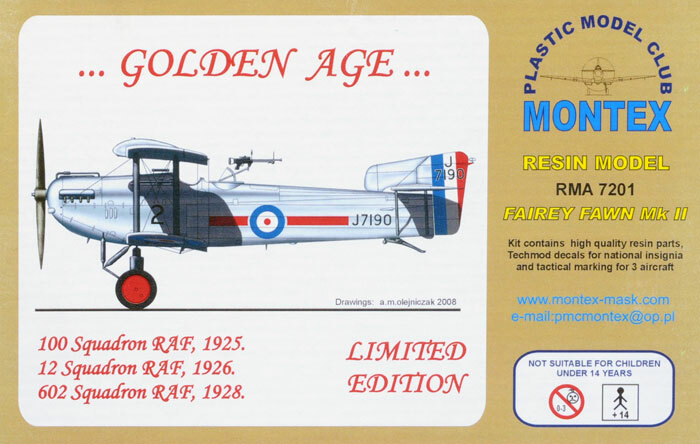 Montex have to date produced a fine line of 1/32 scale resin aircraft kits, this now appears to be Montexs first foray into 1/72 scale. It is certainly a good start. The kit parts come well packaged in a sturdy top opening box. Inside the resin parts are distributed among five zip-seal bags. 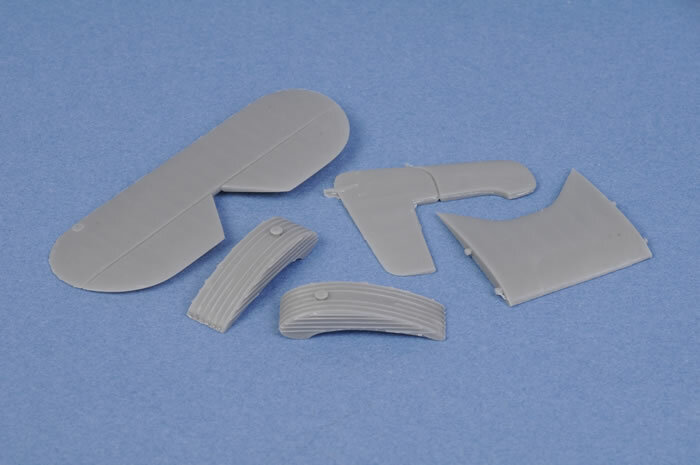 The castings of the parts are all smooth, free of warpage and it is very hard to find any evidence of air bubbles. Flash is for the most part, minimal and restricted to a few smaller parts, nothing that is beyond five-ten minutes clean up. The wings are beautifully rendered, they are commendably thin and the effect of the linen stretched over the wing ribs is most convincing. The top wing is assembled from three pieces, while each lower wings features locating pins for the fuselage/wing joint. Locating pins are also featured on the two fuselage parts. A quick dry fit reveals that the fit is quite positive and construction should be quite straight forward; this is a well engineered kit. 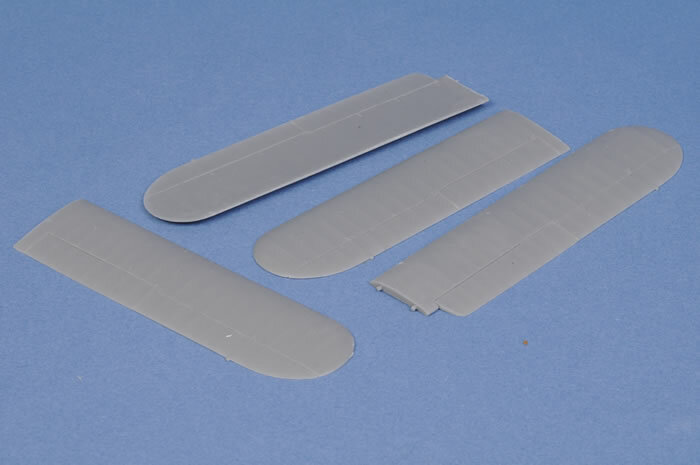 The usual care will be required when applying the top wing, however this more a function of the aircrafts design rather than any deficiency on the kits part. 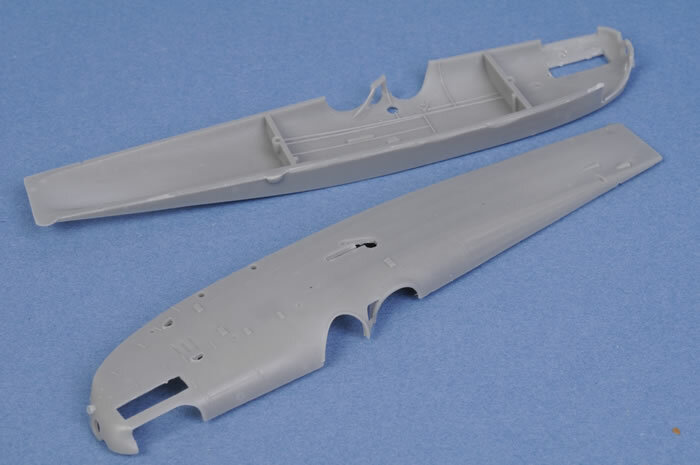 The kit is very well detailed and while it is entirely made from resin parts (no PE bits here) there is a great deal of finesse and very little that the modeller may wish to add. The engine is finely cast as a single piece and comes complete with plumbing and ignition wires. It will be a shame in a way to conceal this little gem within the fuselage. 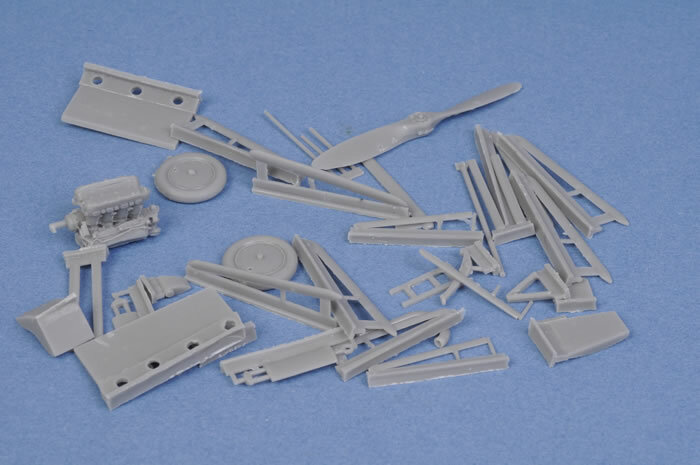 The wheels are one piece and have very sharp details, both the single Lewis and Vickers machine guns are gorgeous. The modeller is aided by the inclusion of a very detailed instruction booklet which also includes a rigging diagram. 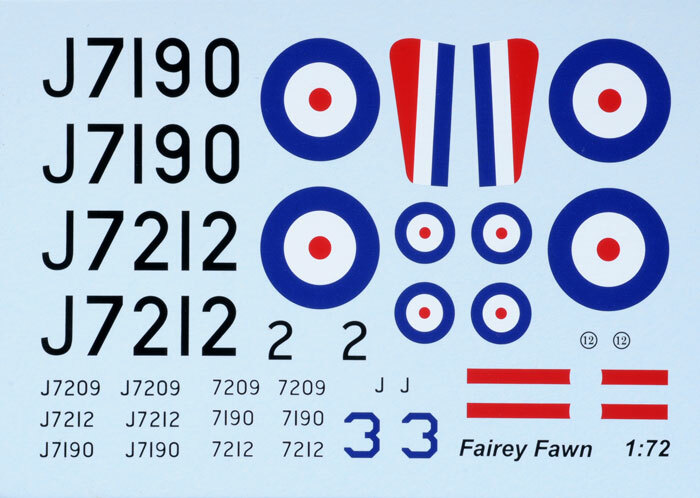 No interior colours are supplied, however an excellent colour profile and plan view diagram is provided and this gives details for the three options provided with the decals, all of them in the familiar silver dope/polished metal scheme of the RAF between the wars. 602 Sqn Royal Auxiliary Air Force, Renfrew, 1928. 100 Sqn RAF, Spitalgate (yes, this is a real place) 1925. 12 Sqn RAF, Andover, 1925. The decals are beautifully printed, they are in register and have good colour density. Very little carrier film is evident. This kit is has clearly been a labour of love for whoever designed it. 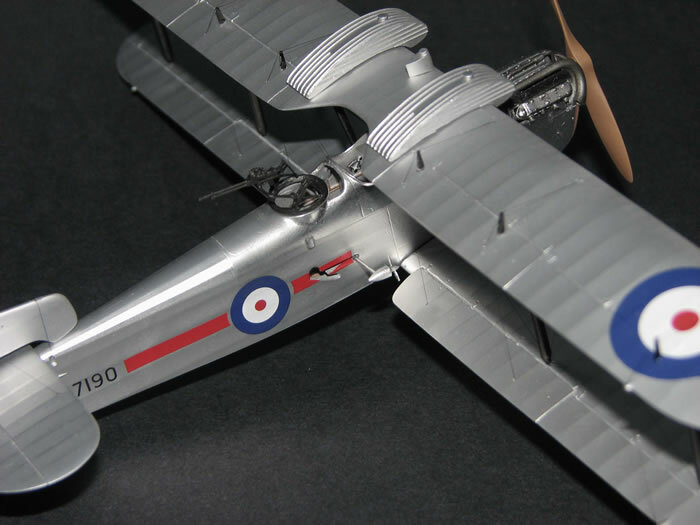 It promises a straightforward construction (for a resin biplane) and offers enthusiast of between wars RAF aircraft a beautiful kit of a very rare machine. For a an example of what can be done with this kit look at Arek Walerowicz's work on Hyperscale June 22nd 2008.